Bags in the real world will never lose their importance in our everyday lives and thus we see a lot of brands and companies coming up with different designs of bags to make the everyday journey even more convenient for us. 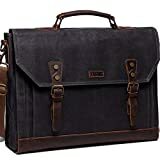 The leather messenger bags we are talking about are specifically constructed to be used on a regular basis, to your workplace or university and most importantly create a long-lasting impression. While leather assures greater durability, the smart designs of these bags are dedicated to serving the lives of everyday commuters in a great way. 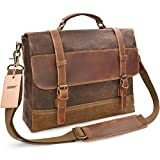 Here is our list of the best leather messenger bags on the market, so that you know which one suits your eyes the most. Though there are plenty of models overflowing in the market, the ones featured below have been carefully narrowed down keeping many factors in mind. 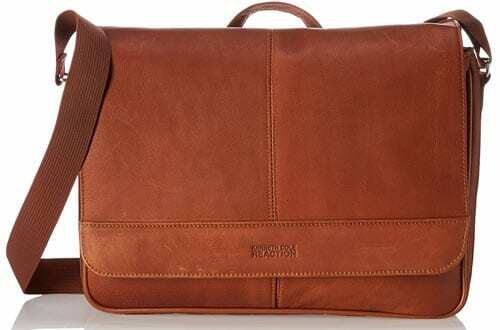 If leather messenger bag is what appeals to you in every way, then this Reaction model from the house of Kenneth Cole is designed keeping in mind the regular needs in day to day lives. The trust of Colombian Leather is combined with a cell phone pocket for better organization and a single gusset flap on the front. To make it more easy to use, the bag is finished off with a top handle for carrying and a crossbody strap. The strap is again finished with padding for comfortable carrying always. Comes with detailed loop handle on the back. Roomy main compartment with a full-length zipper pocket. This amazing piece is crafted from the best of materials to assure a very long life while still look good every single time. Made out of cowhide horse leather and finished with water-resistant waxed canvas, running out of style is never an option with this messenger bag. Furthermore, you have space on your side with this bag as it can easily carry a 15” laptop, then you have dividing zippers, pockets and even a couple of inner slip pockets so that you can carry all you need. The wide strap is comfortable and detachable for flexible using options. Comes with a padded laptop sleeve. Magnetic Button ensures ease of use on the move. 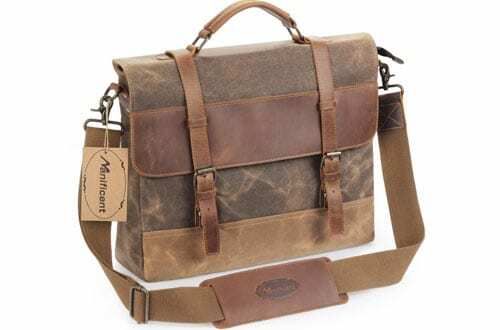 Yet another exciting addition to their list, Newhey’s vintage looking messenger bag can hit the right chords with its superior style statement and great functionality. The cowhide horse leather produces a wrinkled and scratched surface that adds to the vintage look of the bag. Moreover, it comes with a total of 9 pockets, with 5 on the outer side, so you can carry most of your things with yourself. 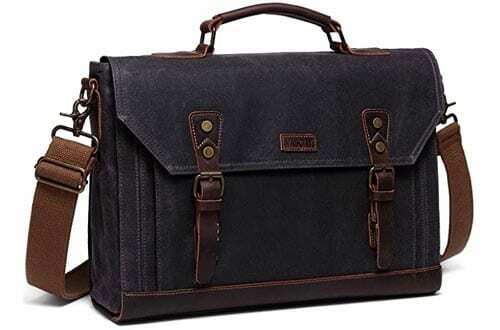 The padded handles can also double your messenger bag to an appealing briefcase. Wide and detachable shoulder strap ensures minimal fatigue. Magnetic snap button makes it more convenient to use. Big enough to carry a 15.6” laptop comes with a padded laptop sleeve. The iconic style of that this appealing leather messenger bag has been brought forward with this piece from the house of KomalC. 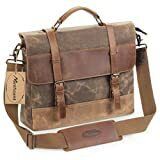 Along with being iconic in appearance, this rustic beauty has been handcrafted by experts of the field with the best of materials like a premium quality of hunter buffalo leather and lined with top-notch canvas, making it both sturdy and comfortable. The snap closures are concealed and make it easier to use on the move while the adjustable shoulder strap will keep you moving in all conditions. Padded compartment for a 15” laptop. Two big pockets on the front that can fit almost anything. 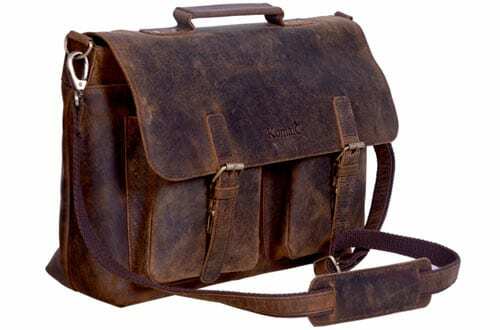 A messenger bag that can serve you for a multitude of purposes, the Cuero leather bag makes a lasting impression wherever you wish to carry it. The use of premium quality materials like treated goat leather and the tough lining on the outside makes it even more compelling for everyday usage. Besides, it has got mobile pockets on the outside while the padded laptop sleeve and a mobile holder is situated right inside. Can be transformed into a good looking briefcase. Imported quality guarantees long life. 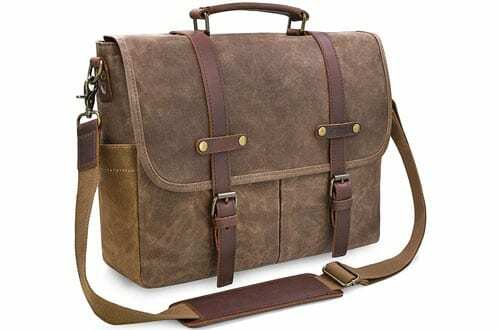 If you are looking for a messenger bag that can be used to carry your laptop carefully, then this is certainly one of the best choices to make. The presence of velcro snap and a padded compartment for your laptop, assures you a shockproof carrying of your laptop. Furthermore, the bag features both inner padding and bottom padding for smart protection of your belongings inside. The carrying handle is also made up of great quality cowhide leather, rewarding you with incomparable durability and sturdiness. Detachable and supreme quality shoulder strap. Multiple pockets and a 16” laptop carrier. Features insert buckle and zippers for added protection. The fabric has a waxed canvas thus makes it water-resistant. 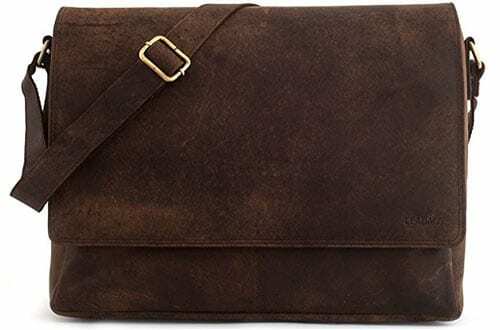 Made out of genuine cowhide horse leather, this messenger bag certainly knows how to look appealing while staying very close to the roots. 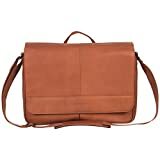 One of the most simplistic designed messenger bags on the list, it carries the modern outlook very smartly. The rugged wash canvas makes it extremely durable while the wrinkled scars look fascinating in every way possible. Moreover, this bag features inner foam padding as well as bottom foam padding, so your laptop is always away from unforeseen shocks. Multiple compartments and pockets for your everyday items. Wide shoulder strap eradicates shoulder fatigue. 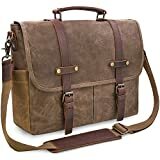 Carrying a messenger bag that can look outstanding and still have all the important features for a perfect everyday companion is always a better option than the rest. 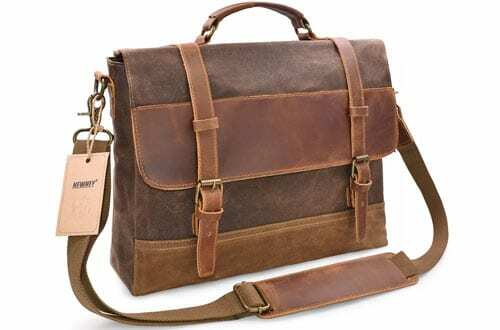 With this leather messenger bag from Tocode, you get a bag which is both water-resistant and still ensure a long life. It is constructed out of cowhide horse leather combined with waxed canvas, thus you get the best of all sides. Furthermore, you get the convenience of a padded shoulder strap to eliminate shoulder fatigue and even change it to a briefcase whenever you want it. Magnetic buckle is fast and easy to use. Large storage, main compartment with 4 pockets. In short, have a total of 7 pockets. 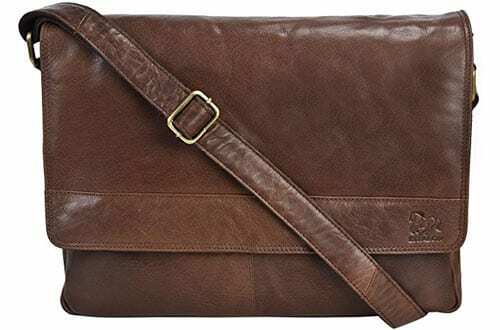 Unparallel quality, incomparable looks, this messenger bag from Leabags is just the right blend of smart, unique and vintage combined with the very best of buffalo leather for greater efficacy. 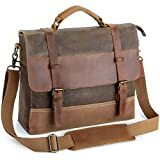 Besides being smart and advanced in both looks and quality, this bag is also on the higher side in terms of functionality. On the inside, you get plenty of room to store all your belongings while the multiple pocket orientation keeps your things organized. Shoulder strap reinforced with nylon, comfort and durability ensured. Reliability of fine stitching and excellent manufacturing. Have enough space to accommodate. At the top of the list features a bag that has the most iconic and classic-look of all. Constructed out of the best of cowhide crazy horse leather, durability will never be a question with this bag. The delicate leather construction is complemented with anti-bronze, making it more appealing to the modern eyes while still being a classic. Moreover, it has got incredible space as well where you can keep a 17” laptop with ease. The multiple pockets on the front back and inside will keep your things secure forever. Adjustable shoulder strap ensures greater comfort. Great support for everyday wear and tear. 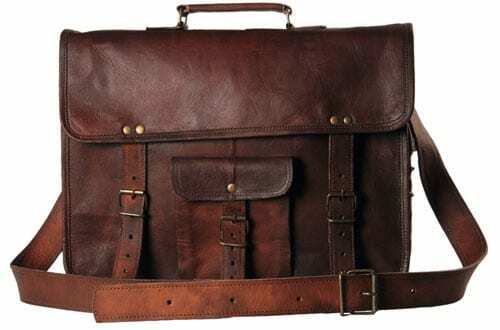 Can be transformed into a vintage briefcase owing to the comfortable leather handle. 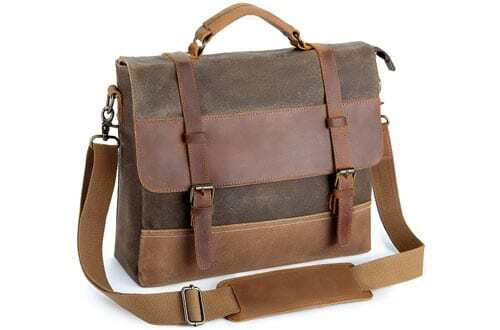 Make a style statement in the crowd full of people and impress other with any of these amazing leather messenger bags.